The use of computers for mainstream entertainment such as listening to music and movie watching is becoming more prevalent, with many households now having a dedicated PC for the task. Within the industry, the trend is seen as the 'next big thing' - we've already written lots about Microsoft Media Center as well as other cases with the same theme. 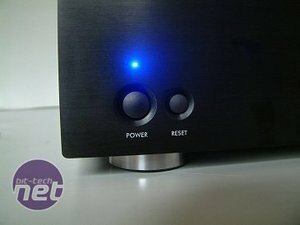 The Home Theatre Personal Computer, in our opinion, has a number of issues to overcome before it is accepted in the family living room alongside the Hi-Fi and TV - namely, its looks and the amount of background noise it produces. 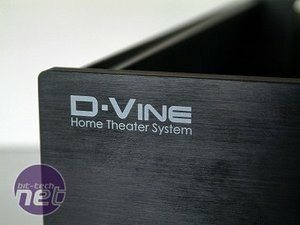 Crucial to this is the case the system is built into - and today, we're looking at the Ahanix D.Vine D5. The Ahanix D.Vine D5 is an all aluminium chassis available in either silver or black anodised finishes. The design is somewhat minimalist and Hi-Fi looking. 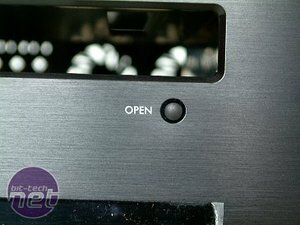 One might think that such a sleek unit would sit well alongside the family Hi-Fi, except for one thing…This case is huge, measuring in at a whopping 435(W) x 145(H) x 458(D)mm. 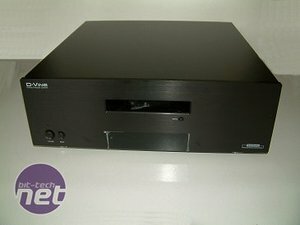 Its massive footprint may well be too much for your Hi-Fi rack or cabinet. The hardware pack includes a mounting frame for the optional VFD unit, a driver disk for the display and a copy of LCDsmartie to run it. Also included is a assembly manual and a replacement brushed aluminium DVD tray front that matches the brushed facia of the case. The front panel controls are basic but nicely engineered. 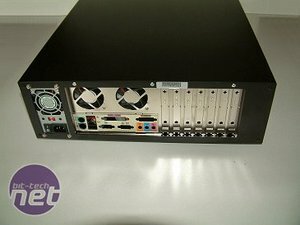 Unfortunately the designers appear to have forgotten the purpose of this case and made it too minimalist by omitting any front panel connectors. De rigueur for a home theatre case would be USB, firewire and audio in connectors. Having to fumble around the back to connect your camcorder or mp3 player is hardly conducive to happy home entertainment - and remember that this case has a huge depth. You could use flying leads, but that would look messy and defeat the object of using a pretty case. 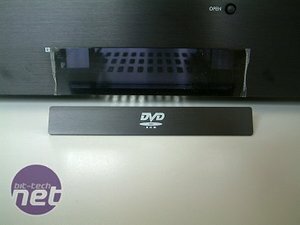 Below the DVD cut out is a smoked plastic window behind which sits the optional VFD display and infrared remote control sensor. Here you can see a close-up of the replacement tray front. 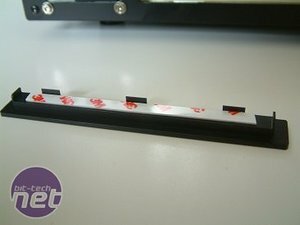 The tray front is affixed with the pre-fitted double sided tape. The rear of the case is standard ATX. 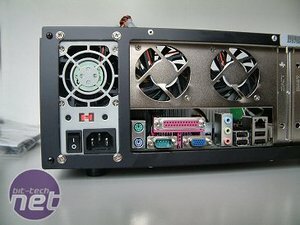 The case includes two 60mm “ultra-quiet” fans and a slim-line 300W PSU.